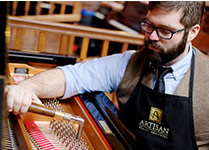 Artisan Piano Services provides a unique blend of old world craftsmanship and care with today’s technology and convenience while delivering unparalleled piano service. We’ve built our reputation on the excellence of our artisans as well as the absolute quality of services we provide. With our staff of highly trained technicians, we carry on the time-honored tradition of music, art and craftsmanship. Whether you are an accomplished professional, a budding artist, a teacher, or a family of beginners, our qualified piano technicians will create a memorable and worthwhile experience at each piano service.